the seal of quality that is issued by the respect department of the government. all other products are seriously based on size, and you should never ignore that at any cost. your time to find if they work for you or not. Start right now! 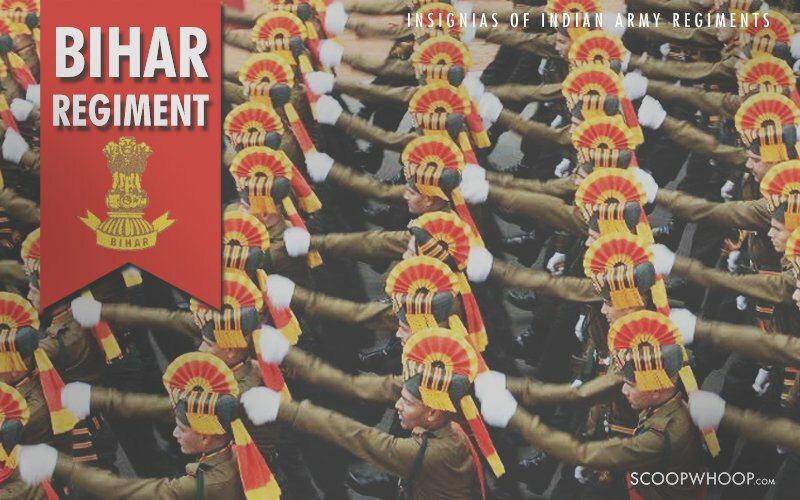 Bihar Regiment: When the Lions Roar!!! Our creative writers had written a blog on Bihar Regiment for a long time. Infact, they had so much to share that the debate was on the title of the blog. 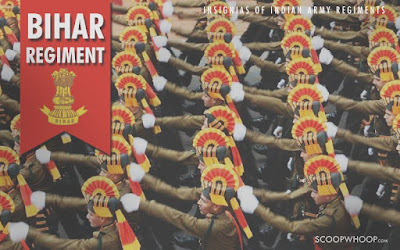 Finally, days after India conducted the surgical strikes in Pakistan and Bihar regiment played a vital role, we decided to title the blog “Bihar Regiment- When the Lions Roar”. Elephants and Lions have historically been the symbol of strength and aggression in Bihar. In the days of yore, it was the fleet of Elephant Warriors only that the army of Great Alexander was not ready to face, hence, returned back without crossing Indus and invading erstwhile Magadha which is current day India. Elephants find a special place in Bihar’s Mithila Art depicting strength and power. Magadh and Maurya dynasties had Lion as its symbol , hence Bihar Regiment proudly owns the badge of Ashoka Lion. In the modern history, Bihar regiment was formed by Mir Kasim to battle the East India Company. Later, Lord Clive inducted them to British Army as Sepoy Battalions. Most soldiers came from Bhojpur region (Modern day Bihar and East UP). For over 100 years from 1740 to 1857, Bihar regiment formed the backbone of Bengal Infantry and British Empire in India. Till 1857, Danapur, a mini city near Patna, was the centre of country’s second oldest and one of the largest Cantonments of India. Bihar regiment (34th and 19th Bengal Infantry) mainly constituted soldiers from Rajput, Brahmin and Bhumihar communities. So when the British wanted them to fire using greased cartridges, Bihar Regiment revolted. This was led by the famos Mangal Pandey at Barrokpore at Kolkata. Mangal Pandey along with Ishwari Prasad proudly met gallows after three Sikh soldiers testified against them. Soon the then King of Bhojpur, Vir Kunwar Singh declared Bhojpur a free state and Bihar troops marched along with him. In the first war of Bhojpur, Bihar Regiment crushed British and few other regiments who fought with the British against India’s independence. After defeat, Britishers re-organised themselves and attacked Bhojpur with greater force. It is said that Bihar Regiment was out-numbered 1: 15 and eventually lost the battle. Importantly, it is this brave regiment that almost single handily won India its independence. The seeds of our independence were sown in this struggle. After India lost its First war of Independence, British disbanded this regiment. People from the region were chided as Purbiya or Bihari and jokes were cracked on them to keep the morale of the people of this region down. A low morale of this population meant no revolution. The people of Bhojpur, Mithila and Magadh (modern day Bihar and East UP) were not inducted into British Army for the next 84 years. Hence, once the backbone of British Indian Army, Bihar regiment did not exist until the British were to face the Japanese and Germans. World War Two is the war wherein fortunes changed as it progressed. Initially when Nazis kept winning, one win was evident to Great Britain in South East Asia. The Japanese were advancing in Burma and Britishers needed fighters who could fight the Chinese and Japanese. British Empire looked towards India’s most fearless region - Bihar. Thus, in 1941 was reborn the Bihar regiment. Finally, Rangoon fell and Japanese wanted to capitalise on their victory and advance. However, Bihar regiment halted their advance and later participated in Operation Tiderace winning back Singapore for British Empire from Japan. The Bihar regiment continues to recruit mainly from Bhojpur region of East UP and Bihar and also from states of Maharashtra, Jharkhand, Odisha and Gujarat. Two recent famous heroes are Capt. Gurjinder Singh Suri who gave the supreme sacrifice in Operation Vijay at Kargil and Major Sandeep Unikrishnan who made the supreme sacrifice fighting terrorists during Mumbai attacks. Indian Army and Bihar regiment were attacked by terrorists at Uri in which 19 of our soldiers (18 from Bihar regiment) attained Martyrdom. The Indian army avenged by surgical strikes inside the enemy territory. Bihar and Gorkha regiments along with the Special Forces carried out these surgical strikes. The 10-year-old son of Martyr Naik Raj Kishore Singh, 6 Bihar Regiment, says my grandfather was in Indian Army, my Father has made the supreme sacrifice for Indian Army and I will also join the Indian Army. This 10-year-old, like his father, is also the son of Bhojpur. Bhojpur and Rest of India will continue to produce these brave sons. Bihar Regiment and our Indian Army has many Shers in the waiting. imithila.com engages in promoting and selling the original form of Handpainted Mithila / Madhubani paintings Home Decor and Handloom products. For owning one masterpiece for yourself, log on to www.imithila.com. If you want to share more details about this tradition, please write to us at business@imithila.com. Ganpati Bappa Morya!! With the celebration of Ganesh Chathurthi, the festive season in India begins. We are gearing up for the festivals, planning to give a makeover to our homes and ourselves. These are the special times when we want everything right from our homes to wardrobe look and feel more Ethnic. When we Indians think of an Ethnic attire, be it for ourselves or for gifting, first obvious term coming to our minds is Saree. It would not be wrong to say that sarees have been the identity of Indian women attire since ages. The simplicity and elegance of this attire impresses foreigners as well, hence, demand for sarees is increasing from various other countries as well. Its the year 2016, Digital India is the new popular term. With telecomm players claiming to revolutionize the internet and more people having easy access to the internet, buying Online becomes the trend and need of the hour. More so, availability of numerous options in each product and convenience, make online buying even more attractive. In case of Sarees also, there are infinite varieties available online. All different from each other and yet unique. For the lovers of Organic Madhubani Painting Sarees made by artisans from various parts of the country, good news is you can now find them online. They are vintage, classy and sophisticated. But before buying them online, you should keep few of the points in mind to get the best. We all are quality conscious,we ensure what we wear must be of high quality. This cannot be an exception when you buy Madhubani Ethnic Sarees. The most important parameter while buying a saree is the quality of the material with which the saree is made. Pure Tussar Silk, Paper Silk, Matka Silk, Ghicha Silk are a few to name in Silk category. It becomes most important as it decides the weight of the saree and how it would look after wearing. The beauty of a Madhubani Painting Saree is with the finesse with which it is handpainted At present,a large number of manufacturers are engaged in the production of Madhubani sarees. You will find huge deviation in the prices of sarees across stores. The reason being, alot of these manufacturers get the sarees printed by machine and not handmade. Sarees are made by people from all experience level. It is the finesse of the work which makes it high quality and this finesse comes from years of dedication and practice. Hence, it is quite obvious, finer the work, expensive the saree. This is a gift of the Internet where you can find the opinion or testimonials of the users through various online platforms. Apart from the websites, you can find loads of users’ opinions through forums and other such communities. Join these platforms, and participate in the discussions there. You can always find some answers if you raise questions regarding the quality of the online sarees that you are planning to buy. Our home is an extension of our own personalities, it is said. Everyone wants to style his/her home differently and tastefully. Here, paintings play a vital role in giving our homes that vintage and classy look and most of the homes have that. Many of us who are creative and God gifted, like to put their own paintings whereas others prefer paintings made by professionals. A lot of you must have seen and admired the Madhubani art form that has a rich history and is believed to centuries old. The art form has unique features that makes it splendid. Madhubani Painting has been very adaptable and with time has undergone changes that has made it fit for commercial purposes. If you have an eye for originality and beauty and are keen interest in buying paintings online, you must look for Mithila Paintings. While you buy paintings online, list of a few points will come handy. Each Mithila Painting depicts a story, interesting and unique, waiting to be told. If you like a painting, take a moment to read its description. As an example, this painting depicts the Raas Leela of Lord Shri Krishna and selfless love all the Gopis had for him. Read the stories of paintings and know more about the rich Mithila culture. Just by looking at the product pictures online, one can not know the size of the painting and how it would appear on the walls of your home. In the description section, dont forget to check the size of the paintings. The largest generally available size of the painting is 22 inches in length and 30 inches in width. This is also called a full canvas. Few of the sites give you the option of having larger paintings varying from 2 canvas to 4 canvas, which are made to order. Paintings are made by people from all age groups. It is the finesse of the work which makes it high quality and this finesse comes from years of dedication and practice. Hence, it is quite obvious, finer the work, expensive the painting. 4.To Buy Framed or not Framed, Thats the question!! A framed painting saves you the time and effort of getting it framed. You just have to order it, get the deliver and you are done. Just open and hang it without any further hassles. The painting will make your home look unique and stylish. Alternatively, if you want the frame to be matching with the color of your wall, you can own an unframed one and get it framed as per your liking. imithila.com engages in promoting and selling the original form of Handpainted Mithila / Madhubani paintings Home Decor and Handloom products. For owning one masterpiece for yourself, log on to www.imithila.com. If you want to share more details about this tradition, please write to us at business@imithila.com. Okay, so you love experimenting with your style and you know contemporary extravagance with a dab of traditional poise is the new cool, its time to take your wardrobe experiments to a whole new level with Madhubani paintings. Inspired from the motifs of Mithila, dwindling crafts and classical artistry, their designs are revived in traditional prints. Mithila is the region comprising of North Bihar and bordering Nepal. As this artform is related to the cultural activities of Mithila, it is also widely known as Mithila painting. In the bygone era, these crafts were painted with natural resources like colors from vegetables and flowers. Now, the women of Madhubani work day in and out to revive this ancient Indian folk art through their paintings. Dominance of Radha Krishna Rasleela designs are evident in Mahubani paintings to celebrate their eternal love. Fish on the other hand holds a significant place in Madhubani designs because it is reminiscent of mythological motifs. According to Hindu mythology, apparently Lord Vishnu’s first incarnation was that of a fish or ‘Matsya’. Whereas, peacocks are noticeable in various designs and artwork of Madhubani because they have been acknowledged as the purest of living being since ages and still are. Let’s flick through some of the works reflected in sarees, kurtis and dupattas. 1. Sarees for every occasion: From paintings of Radha Krishna’s depiction of love to fishes facing each other, Madhubani painting ethnic sarees depicts the beauty of Ancient Indian saga. Shown below is the border of the Green Tussar Silk Saree which recreates the magic of dancing peacocks in the rain. 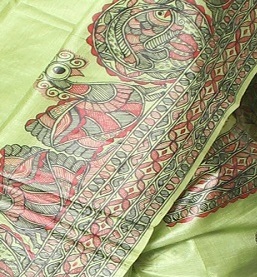 Madhubani painting ethnic sarees are also available in vibrant colours and designs of similar themes. You can buy Online Madhubani Sarees where COD is also available. 2. Customized kurta/kurti: Be it for men or women, there’s nothing like a custom made kurta or a kurti. Opt for a Madhubani painting kurta material with rich colours. With a perfect combination of this piece and a churidaar, stand out of the crowd in a marriage ceremony or in special occasions like Diwali or Durga puja. Buy Madhubani Designs for Kurtis online where you would be spoilt for choices. 3. Steal the show with striking dupattas: Whether you team it with a pair of jeans and tee or with a salwar kameez, a vibrant dupatta can never fail to up your style quotient. 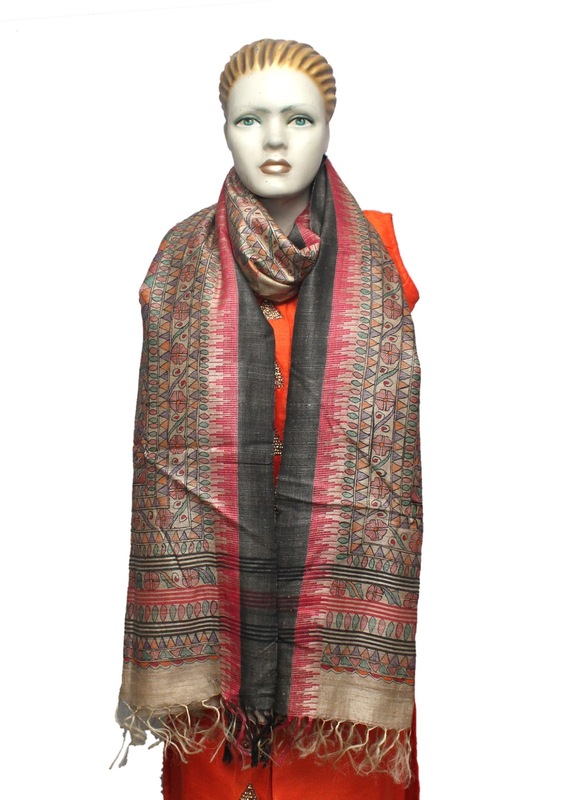 Madhubani painting based dupatta is just the right thing for you. Interesting interplay of colour and designs makes it all the more irresistible for ethnic wear lovers. Shown below is a Tussar Silk Dupatta with exclusive design all over of the dupatta. Hmm..That’s not all! Other products like wall art and décor are also available in Madhubani paintings. So what are you waiting for? Choose your pick and buy Madhubani Painting Products Online from www.imithila.com. Be Ethnic and Stylish with the Latest Trends in Madhubani Painting !! Be it for a special occasion or a regular day at work – women love to sport ethnic wear with equal poise. On social networking sites, posting beautiful selfies in their favorite saree seems to be the latest fad of modern day women. Though printed kurtas/kurtis have always been popular, to stand out of the crowd, specialized artworks are what turning heads of ethnic outfit enthusiasts. One art form grabbing a lot of eyeballs now a days is the Mithila or Madhubani painting. Mithilanchal, a region comprising North Bihar and the Nepal border, has always been famous for its penchant for art and rich culture. Though this Painting is practiced in most of the Mithilanchal belt, in modern days, this art form has gained popularity as Madhubani Painting as Madhubani's crafts are associated with cultural activities of Mithila. The popular belief is, this specialized form of painting was commenced by Raja Janak who appointed local artists to decorate his palace with mural paintings for solemnizing the marriage of his daughter Sita to Lord Rama. Since decades, Mithila women have been engaged in reviving the stories of ancient India through their paintings. From sarees to home décor – the hard work of these women will never fail to amaze you. Already curious about their work and thinking of buying some of their products! Well, you can do it right from your home as you have an option to buy Madhubani painting products online. Let’s see some of the special works of Madhubani paintings. Time travelling in ancient India with style is now possible with Madhubani Painting Ethnic Sarees. Hang on, these are not yet-another designer sarees. Their uniqueness lies in the stories they depict. From Kohbar to dancing Life of Tree, each has a beautiful tale to offer. Even Radha Krishna ‘Raasleela’ has found a special place in the borders of Madhubani Painting ethnic sarees. 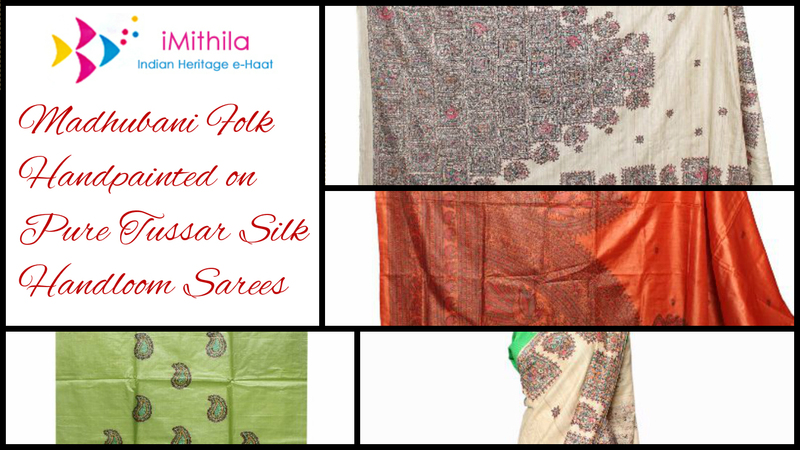 They are available in Handloom Tussar silk and Cotton. Most of the modern day women, who have to travel a lot due to work or other commitments, prefer Kurta/Kurtis over sarees. They can always opt for Madhubani Painting Kurta Material and customize the style and pattern as per their requirement. Attractive colours like Beige, peach, torquoise, rose pink, olive green are adorned with beautiful folktales in these kurta materials. Buy Madhubani Designs for Kurtis and be a stunner. Whether you are a college goer or working in an office, at least a pair of stunning dupattas have a place in your cupboard, isn’t it? You can also try Madhubani Painting Based Dupattas to look your traditional best. The stories of dancing peacocks, auspicious fishes, Gopis (lady devotees of Lord Krishna) are intrinsically etched out in these specialized dupattas. There are two things that most South Asians have an experience to share- Cricket and Mangoes. Both cricket and mangoes invoke a feeling of nationalism and sub-nationalism in South Asia. Mangoes , unlike cricket, is a native of South Asia or erstwhile undivided India. For thousands of years we have produced more than 50% of World’s total Mango production and more than 60% of Mango Varieties globally. Now with more than 100 varieties around, the big debate has always been – Which Variety is the Best? In Maharashtra, Alphonso is the favourite. At Karachi, Anwar Ratol is rated the best. In some parts of Bihar, Dudhiya is the best while Mithilanchal prides itself in its own variety of Malda. For states like Orrisa and West Bengal, Langda is the best while Uttar Pradesh loves their Dasehri. All these famous varieties of different regions; Malda of Mithila, Dudhiya of Bihar, Langda of Bengal and Anwar Ratol of Pakistan, belong to the same clan of mangoes. In other words, it is the same mango with a different name. Thus, in the World’s Den of mangoes, it is one variety that dominates the roost. One reason for Malda’s dominance lies in its unique fragrance and fertile black soil which makes Malda Sweeter. As history has it, the Malda AAM was taken to different parts of India by Maurya dynasty and later to countries like Thailand and Malaysia by King Ashoka. With time, Malda with cosmetic changes and in the long debate of which Mango is the best has assumed different names. While we leave the debate open on which variety is the best, at imithila, we strongly agree that Mango is undisputedly the king of fruits and which variety you like the most depends on your childhood experience and taste buds. Undoubtedly Mango as the National Fruit of India should not be in any controversy. 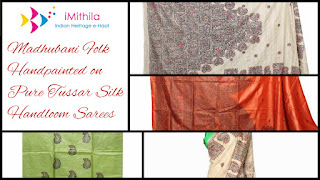 imithila.com engages in promoting and selling the original form of Mithila / Madhubani paintings on clothes and handmade paper. For taking these auspicious paintings home, log on to www.imithila.com. If you want to share more details about this tradition, please write to us at business@imithila.com.